Havaianas Race to Hawaii ~ Philippine Freebies, Promos, Contests and MORE! 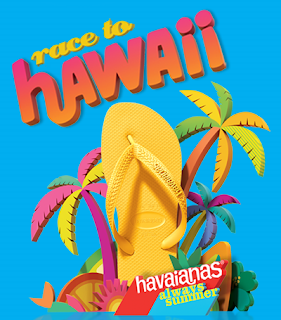 Have fun this summer with Havaianas' Race to Hawaii promo and contest. Every 2 pairs of Havaianas purchase entitles you to join either a weekly raffle or a chance for a trip to Hawaii. You decide your fate. If you go for the raffle, you have the chance to be one of 105 winners of Sony electronics and gadgets, gift packs and Hawaiian Tropic gift packs. However, if you go for the Race to Hawaii contest prepare to be in for a race of a lifetime. You and a teammate have to race against 100 participants in the elimination round and 20 participants in the final round at Boracay. Whoever emerges with the fastest time will Win an all-expense-paid trip to Hawaii. 100 teams (with the registered team member) must complete a series of fun, summer tasks to finish the race. Upon registering in Boracay, all teams will be provided with a gift pack con taining a Havaianas shirt, Havaianas pair, and gift packs from David & Goliath and Hawaiian Tropic. Accommodation for six days, five nights. "Tax for the prizes will be shouldered by the winners"